Proper Prep = Smooth Delivery! Shipping a boat boat with Ship Your Boat is a great way to save wear and tear on your crew and/or equipment. It will surely get your vessel to its destination in a quick and efficient manner. With our extensive history of working with truckers, boaters, shippers, port personnel, DOT, permit agencies, marinas and boatyards, our clients find themselves having fewer delays and greater payload security. Shipping a boat in a safe, secure, and on-time manner starts with meticulous planning and preparation. Please note that we do not prep for boat shipping. This responsibility rests on you as the boat owner and not the transport company. Have the vessel completely prepped prior to our drivers coming to pick it up. If you do not have your vessel ready to ship at the time of pickup, then a fee could be imposed for unnecessary delays. 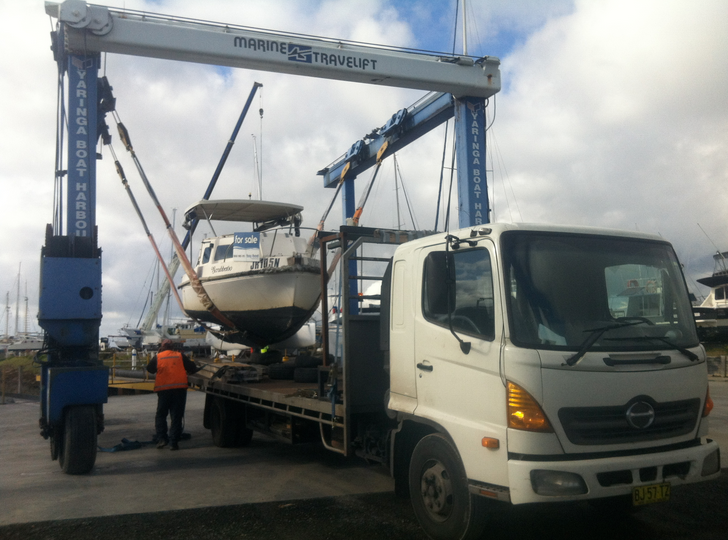 If you need assistance with prepping or de/re-commissioning your vessel, we can certainly help in connecting you with a full-service marina, boatyard, marine surveyor or captain to meet your specific boat hauling needs. It’s imperative that everything is secured. It doesn’t matter how far you are transporting your boat, you should secure it as if you were crossing the ocean. Anything that may extend beyond the hull and could come loose and cause damage during the trasport. The following should be removed or properly stored; exterior electronics, anchors, antennas, flagstaffs, any valuables, propellers, outriggers, canvas, screens, weatherboards, drain plugs, radar transmitters, dinghies, hailers, and Isinglass. Please drain fuel to ¼ of a tank, as well as the water tanks. If shipping a boat during the winter months in a rather cold climate, make sure to drain all water systems including the air conditioners and pumps. Disconnect the batteries and tie off the cables to prevent contact. Secure the engine hatch and check for any other loose items that could become loose during the haul. Consider applying a linseed oil treatment prior to shipping. Check cradles and trailers for fit and bolt snugness as well as sturdiness, road-worthiness, and structural integrity. If your cradle or trailer breaks in transit, we cannot accept responsibility. If you need professional cradling please notify your shipping coordinator. Make sure that your vessel is adequately protected if anything happens to go wrong during the boat transports. You should consider discussing the insurance options with your logistics coordinator so you can become aware of coverage options. Be sure to provide very detailed specifications of your vessel. Failure to supply accurate dimensions will severely handicap us in giving you an accurate quote of price and time. Length: When measuring overall length be sure to include bow pulpits, swim platforms, outboard motors and outboard motor brackets. If the motors or out drives are in the raised position, make sure to include that measurement as well. 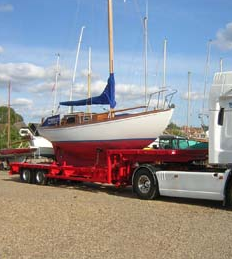 If the boat is on a trailer, please include the distance from the tip of the trailer tongue to the end of the motor or out drive. Many overpasses have a maximum height of 13 feet 6 inches, so if your vessel has an overall height greater than that the delivery will require special handling and routing which will incur an additional cost. Height: Measure the overall height from the bottom of the keel to the highest non-removable part of the vessel. The draft plus clearance equals total or overall height. If the bridge can be removed then measure the vessel without the bridge but please provide the bridge dimensions as well to ensure proper pricing and transport. Beam/Width: Measure beam/width at the widest part of the boat including any attachments. If your vessel is wider than eight feet six inches, then it most likely will qualify as an oversize load and require permits. Once you properly prepare your vessel you can sit back, relax and rest assured that Ship Your Boat Now has your vessel in good hands.